Matthew 7:21 - “Not everyone who says to Me, ‘Lord, Lord,’ will enter the kingdom of heaven, but he who does the will of My Father who is in heaven will enter. “Trinity is not a biblical term. So if one believes in the existence of all 3, does he have to believe that they are equal or that they are all God for salvation? The Bible says believe that JESUS is the SON OF GOD and that HE died for our sins. 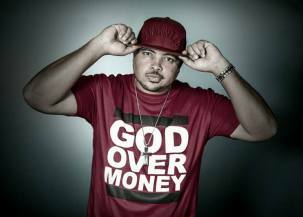 So I cannot tell someone who believes JESUS died for their sins and walks according to scripture, that he is not saved,” he stated. The argument that the word “Trinity” is not a biblical term has been the go-to sonnet of Trinity-denying heretics for ages. The word may not be in the bible, but the concept is most certainly there, and the nature of God and who He is in all of His persons is essential to knowing Him and having a relationship with Him. 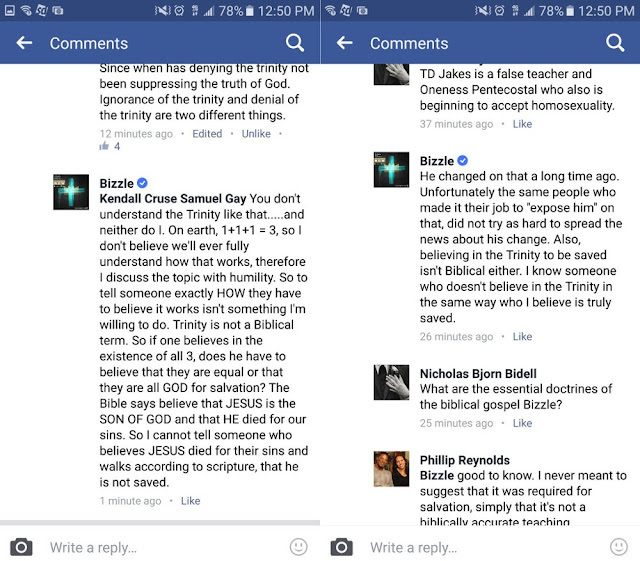 Using Bizzle’s logic, nearly any cult member who professes the name Jesus could be saved. Further, to deny that any person of the Godhead is God is to deny the deity of God completely. But what it boils down to is this: do you know the real Jesus, or a false Jesus? “Unfortunately the same people who made it their job to ‘expose him’ on that did not try as hard to spread the news,” he continues, “also, believing in the Trinity to be saved isn’t biblical either.” Of course, this is opposed to the historical orthodox teachings of the church. To deny the Trinity usually means one of two things: either Jesus is consigned to a subordinate position that denies or devalues His deity, or some form of unorthodox polytheistic view of the Godhead is embraced. Notice, Bizzle provides no scripture in context to justify why he implies believing God is triune is not essential doctrine and he provides no scripture in context to support his defense of false teacher - T.D Jakes. 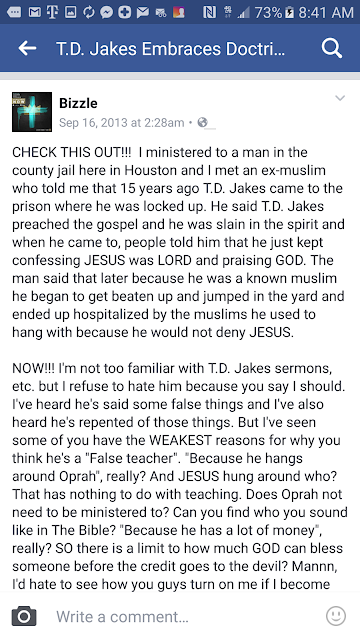 T.D Jakes is a false teacher who preaches a false gospel known as the "health, wealth, and prosperity gospel". God condemns false gospels as seen in Galatians 1:6-9 . 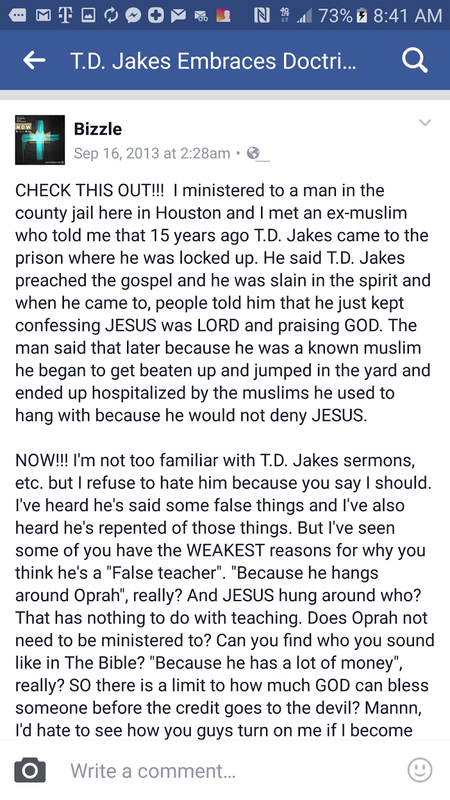 T.D Jakes preaches godliness as a means to financial gain and God clearly condemns this as seen in 1 Timothy 6:5-11. 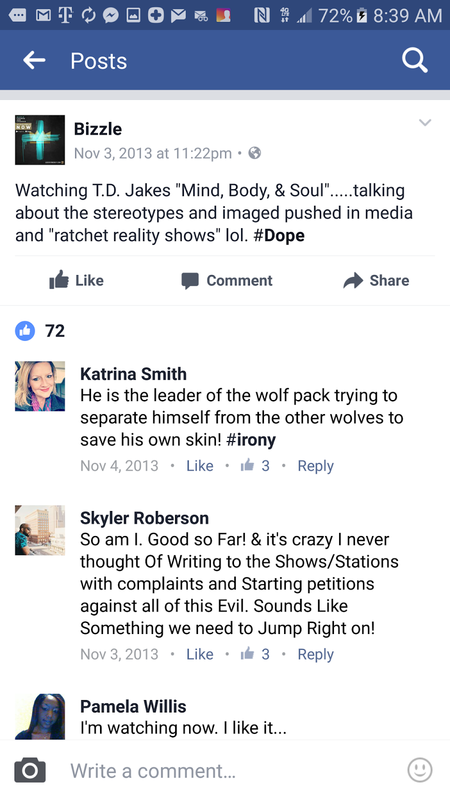 Romans 16:17-18 is clear yet Bizzle defends and shares stuff from T.D Jakes online even though Jakes preaches a false gospel that leads people to hell apart from God. Here is a video from Saiko Wood addressing the situation with scripture.